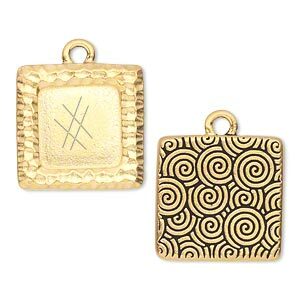 Drop, TierraCast®, antiqued gold-plated pewter (tin-based alloy), 18.5x18.5mm two-sided hammered flat square picture frame with swirl design on back and 12x12mm square setting. Sold individually. Antiqued gold-plated square setting adds a timeless design shape to dangles and drops. 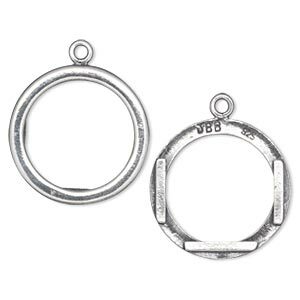 Each setting accepts a 12x12mm square embellishment. Using a 2-part epoxy is recommended. All original designs, copyrighted by TierraCast®. 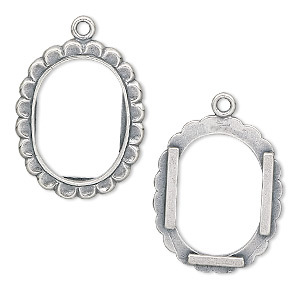 Drop, JBB Findings, antiqued sterling silver, 25x21mm round picture frame. Sold individually.